I recently came back from a trip to Prashar Lake; and for our night stay there, we stayed at Kishna Camps. There are a few other accommodation choices as well at the lake; and to be honest, our stay with Kishna Camps was completely a fluke. The choice however did not prove to be a wrong one at all; and overall, our stay was a satisfactory one. Below is a short review of how I found their services and whether or not I will recommend them to anyone else. The biggest problem of accommodation at Prashar Lake is really of washrooms. There are three kind of places here that you can stay at. One are the cemented government guest houses; other one are the dormitory type rooms provided by the temple itself; and the last one being the camp sites. Which one you would stay at is really a personal choice but camping here seems to be the preferred one. People drive all the way up here to spend one night in the hills camping next to Prashar Lake. Some people however would stick to the comforts of a cemented hotel and choose to stay at the guest house. I was in the 3rd category that day. I have done my fair share of camping but for the stay at Prashar Lake, I really wanted to stick to either PWD or Forest Guest house. As luck would however had it, we did not book the guest house in advance and upon arrival, the caretaker did not let us in. We were told that the washrooms were not functional but I knew he was just using that as an excuse to not let us in. Nonetheless, we checked out the dormitory rooms run by the temple but they really were not that hygienic. So now we were left with just one choice, to camp. There were a couple of camp sites right next to the lake but they did not have washroom facilities. So it meant that we will have to walk into the nearby jungle to do our business. And that is how we ran into a local there who suggested us Kishna Camps because they had properly built washrooms. The camp site as it turned out later was actually his own. The only problem was that the camps were at a little distance from the lake, about 2 kilometers, but that did not seem like much of a problem at that time. We checked in with him for a price of Rs. 1100 per person; dinner and breakfast included. He drove us in his Bolero Jeep from the temple all the way to his camp site which was really a blessing because we were in no mood to walk. The camps were of decent quality but I really liked the location. Please see the picture below. It was already dark by the time we got here and there were a couple of other groups already checked in. Pretty soon a huge bonfire was lit and it was time for everyone to sit around and chit chat. The owner was a really very friendly guy and he catered to the needs to his guests quite efficiently. The food served was simple but very delicious and on time. We visited Prashar Lake in February which meant snow all around and zero degree temperature. Everyone was continuously asking for hot water for every little thing and it was instantly made available which was a great benefit. The greatest advantage however was the 2 cemented washrooms; specially if you are traveling with family. The camps, though look small in size, were decently large enough to accommodate three of people. We were provided good quality sleeping bags and even though it was a frozen February, we remained quite warm at the night. I wouldn’t call it a super comfortable night but we made it through peacefully and slept sound. 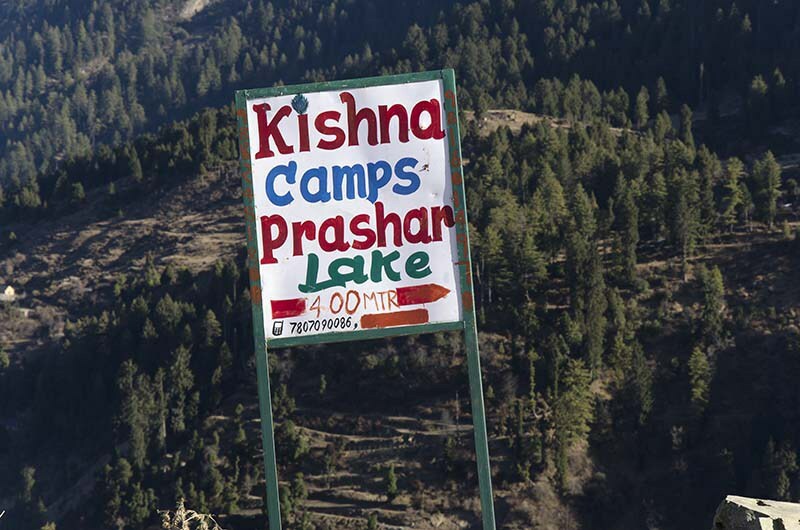 Overall, if you were planning a trip to Prashar Lake then Kishna Camps can be a good place to stay. You can contact the owner at the number mentioned in the first image. To reach the camp site, you will have to continue walking about 2 kilometers after crossing the lake. 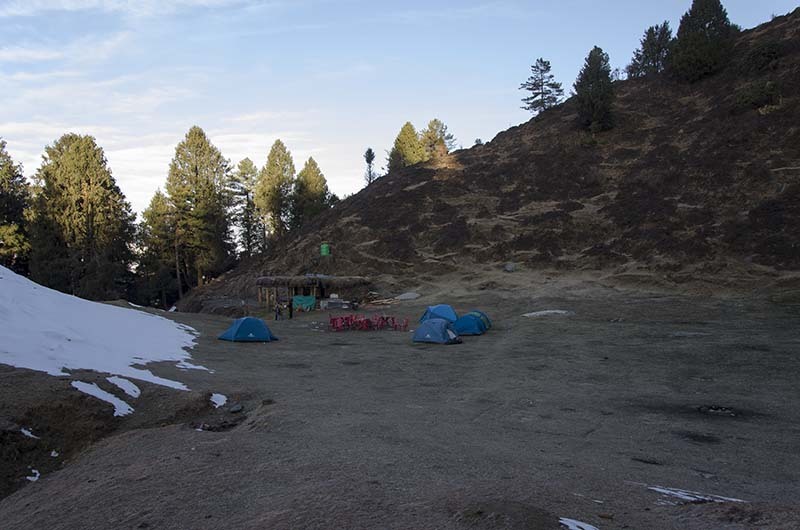 If you have feedback to share about Kishna Camps or any other camp site at Prashar Lake then please feel free to do so in the comments section below; or at our Community Forum.